Has any Tory spoken about the cartoon crisis yet? "Exterminate those who slander Islam." "Behead those who insult Islam." "Europe you will pay. Your 9/11 is on its way." "Be prepared for the real holocaust." 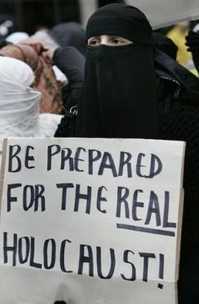 Those were just some of the chilling messages that demonstrators were parading through the streets of London yesterday. I can’t find any Tory statement on the Danish cartoons (see them here). Have I missed a statement? Has David Davis commented on the nature of these Muslim protests? Has William Hague talked about the impact on European relations with the Muslim world? Has David Cameron encouraged a free press to assume some "shared responsibility" for community relations? It might be sensible for the Tories to say nothing. I really don’t know. What do y’all think? 52 comments for: Has any Tory spoken about the cartoon crisis yet?